Download Press Release in Chinese. 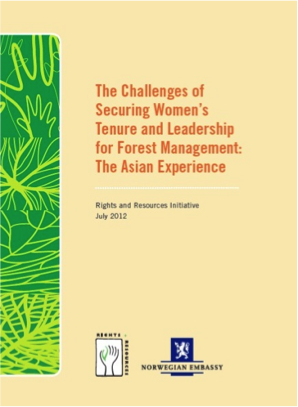 New research released today at the the International Workshop on Gender and Forest Tenure in Asia and Collective Forest Tenure Reform in China shows that despite more understanding, more resources, and policy recommendations, women continue to be largely marginalized and ignored or exploited in resource management processes throughout Asia – to the detriment of global climate and poverty reduction goals. This new research links analyses on the status of forest tenure rights and gender rights across South and South East Asia. The suite of analyses demonstrate that exclusion and inequality on gender grounds are still rife and complicated by the intersection of cultural and social norms, economic pressures, and inadequate legal and institutional frameworks. Authors of the studies call for emerging programs and policies to combat climate change or encourage sustainable development to incorporate lessons learned. Marlène Buchy is both trained as a forester and a social scientist, and for the last 20 years has worked extensively on natural resource management in South and South East Asia. Her areas of work include governance, gender and social equity, power analysis, and participatory learning action, methodologies and methods. Kaplana Giri is a forester by training with substantive knowledge and experience in gender relations, environmental governance, innovation approaches, livelihoods, climate change and REDD+ in South and South East Asia. She is currently a Gender and REDD+ Expert at USAID’s Lowering Emissions in Asia’s Forests (LEAF) Program. Jeanette Gurung is Founder and Director of Women Organizing for Change in Agriculture and Natural Resource Management (WOCAN), and a Gender Expert of the Program Advisory Committee of the CGIAR Participatory Research and Analysis program. Abidah Billah Setyowati is a project coordinator for Capacity Building for Women’s Leadership in Farmers Producers Organization in Asia and the Pacific Region, WOCAN. Her expertise includes natural resources and climate governance, community forestry, community based approaches to resource management, and gender in Southeast Asia. Joan U. Jamisolamin is Grants Manager at the Philippines Regional Office of The Samdhana Institute. Mia Siscawati is a Ph.D. Candidate in Socio-cultural Anthropology at the University of Washington, USA.. She is a founding member of RMI-the Indonesian Institute for Forest and Environment, and a member of the advisory board of KAPAL Perempuan. Avi Mahaningtyas is the Chief of Cluster, Environmental and Economic Governance at the Kemitraan-Partnership for Governance Reform, Indonesia. She is also a fellow of the Samdhana Institute. Xiaobei Wang is a Gender & Land Tenure Specialist at Landesa, the Rural Development Institute. Xiaobei Wang has rich experience in field research and empirical studies on women’s land rights, legal aid, and the interaction between statutory and customary law in China. Cécile Ndjebet is a community and land rights activist devoted to mainstreaming gender into development and advocacy for women. Cécile is the President of The African Women’s Network for Community Management of Forests (REFACOF), a women’s network with members spanning 14 African countries. Arvind Khare is a natural resources management specialist with more than 20 years of experience in the non-profit, corporate and public sectors. He is currently the Executive Director of the Rights and Resources Group. Augusta Molnar is the Senior Director of Country & Regional Programs for the Rights and Resources Initiative. Her experience is on gender and natural resource management, community forestry, and related social issues. Augusta has worked with international development agencies on these issues of forestry for over 20 years. Ganga Ram Dahal is the Regional Facilitator for the RRI Asia Program. Naomi Basik supports the coordination and management of the RRI Asia Program and contributes to RRI’s analytical work pertaining to Asia.